Snrky: In that case, I’m taking a sick day. I took an arrow to the knee. In that case, I’m taking a sick day. I took an arrow to the knee. We've had Skyrim humor before. Although that was 2011. Time flies! Time to move on to another source of humor, perhaps. 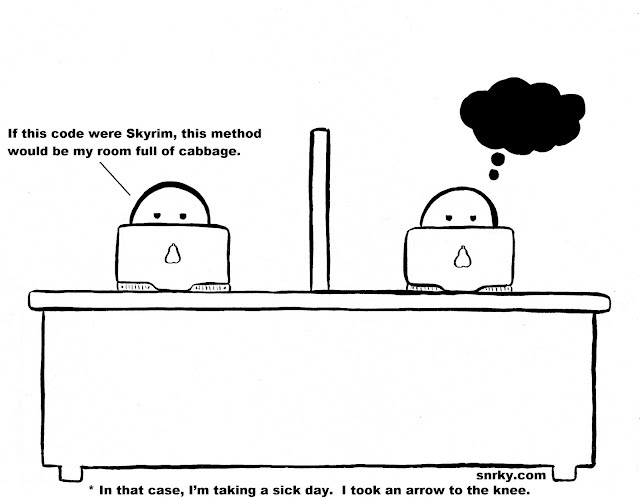 You can catch the Skyrim Tumblr if you need a fix. We'll move on to Bioshock, Gears of War, or XCOM. Maybe some humor about missing time. For some additional laughs, I strongly recommend these three pages. Hilarious, if you're not my wife. She doesn't think they're funny at all. Snarky: If this code were Skyrim, this method would be my room full of cabbage. Title: In that case, I’m taking a sick day. I took an arrow to the knee.